We’d love your help. 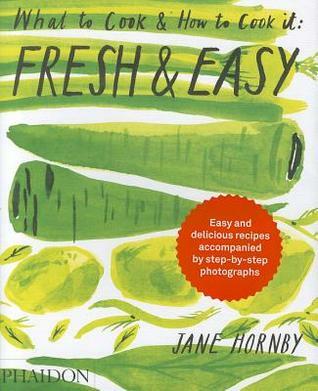 Let us know what’s wrong with this preview of Fresh & Easy by Jane Hornby. What to Cook and How to Cook it: Fresh & Easy is the only cookbook you’ll need this summer. Cooking simple, tasty dishes using fresh and wholesome ingredients has never been easier. 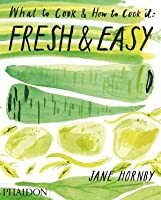 In What to Cook and How to Cook it: Fresh & Easy, established food writer and recipe editor Jane Hornby has created a mouthwatering collection of 75 easy, step&hyphen;by&hyphen;s What to Cook and How to Cook it: Fresh & Easy is the only cookbook you’ll need this summer. Cooking simple, tasty dishes using fresh and wholesome ingredients has never been easier. In What to Cook and How to Cook it: Fresh & Easy, established food writer and recipe editor Jane Hornby has created a mouthwatering collection of 75 easy, step&hyphen;by&hyphen;step recipes for simple dishes that make the best of fresh, seasonal vegetables and fruit, meat and fish, and shows how straightforward it can be to cook simple meals from scratch using fresh ingredients. To ask other readers questions about Fresh & Easy, please sign up. I love this book. The photos show all the ingredients 'mise En Place'= measured and in it place. so you can see at a glance, do you have all the spices? There are more photographs about how to cut protein, what it should look like after it is done cooking. And the end meal. Made four recipes in a week - amazingly simple layout with clear instructions. This book is great for occasional/confident cooks as it has 6+ how-to pictures per recipe. I just can't get enough of this book, the recipes I have cooked so far have been delicious (my partner would quite happily lay testament to this as he has been a very willing guinea pig). The photographs throughout are beautifully presented and the recipes themselves well laid out and easy to follow. This is not an exhaustive guide to cooking, but the various recipes are diverse and fun and they don't take too long to prepare and cook. What also sold it to me was that the ingredients lists didn' I just can't get enough of this book, the recipes I have cooked so far have been delicious (my partner would quite happily lay testament to this as he has been a very willing guinea pig). The photographs throughout are beautifully presented and the recipes themselves well laid out and easy to follow. This is not an exhaustive guide to cooking, but the various recipes are diverse and fun and they don't take too long to prepare and cook. What also sold it to me was that the ingredients lists didn't include ridiculously hard to find food stuffs as you quite often find with contemporary cookbooks (one of Jamie Oliver's Cookbooks had a recipe that included cactus....good luck finding that in Southern England). This is a beautiful book - the photography and illustrations are really amazing. However, I find it to be an awkward size for actual use in the kitchen - it's very big and bulky. Because so many steps are illustrated, there aren't as many recipes as you'd think in a book this size. The food is very good, but very trendy. Some of the combinations were just too much for kids, or even for me during the week (vegetable gnudi). Most of the recipes cook quick, and she does give cooking and prep times This is a beautiful book - the photography and illustrations are really amazing. However, I find it to be an awkward size for actual use in the kitchen - it's very big and bulky. Because so many steps are illustrated, there aren't as many recipes as you'd think in a book this size. The food is very good, but very trendy. Some of the combinations were just too much for kids, or even for me during the week (vegetable gnudi). Most of the recipes cook quick, and she does give cooking and prep times that are pretty accurate (she also includes cup measurements, a nice improvement over last time). I also liked that in the grilling chapter she included 'if it rains' tips, so that you don't have to finish the food on the grill if you can't or don't want to. My favorite cook book! So easy to follow. Really a great cook book for those times you have hardly any ingredients but you still have a standard of fresh and flavorful. I just flip through the book and quickly determine if I have the ingredients to make something . The pictures of the ingredients are what makes the cook book in my opinion. I made a couple of these recipes--they are OK. I already know how to cook well, but I was really smitten with the orderly, step-by-step photography of the cooking process. In the end I didn't find the recipes to be anything new for me. This book would be excellent for someone who wants to cook but feels intimidated by it; this book will hold your hand as you learn. Love love love this cookbook! Probably my favorite cookbook I've ever seen. Love the setup of pictures and the step by step layout. So helpful and informative, not to mention beautiful. I just might buy this one! This book is well layed out with a photo of all of the ingreadients as well as a photo for each step in the recipe. This book is amazing! Great clean recipes with vivid photos. I have to buy this book because I check it out too many times at the library! I am not a cook (or a baker) and don't even enjoy doing either but sometimes, you gotta. So make it easy and good -this cookbook does that.